Sally Hansen has come out with two new lines that had me very intrigued, one being Fuzzy Coat with polish that has small bar glitter of various colors and the other being Sugar Coat with polish that has a sugar-like texture and semi-matte finish. 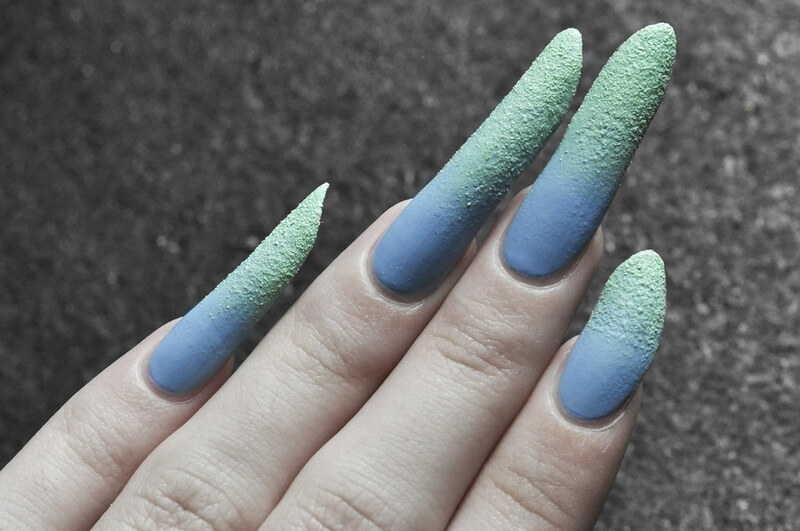 They're rather inexpensive compared to similar lines and I think there's a dupe or two with the Fuzzy Coat ones for shades by Nails Inc., for example, though I haven't tried those particular shades. The above look has one coat of Fuzzy Coat in Tweedy over an ombr é effect. It might look better if I'd used more medium toned shades rather than ones so pastel because the white is hardly visible and it looks like I used leg shavings instead of glitter. Maybe it'd be better on its own with several coats, too. The removal was tough, worse than most glitters, and I didn't even use that much so if I did use it with several coats, I may have to try the glue based method for easier removal. I created a very similar look color-wise with Sugar Coat in Sour Apple over Revlon in Dreamer. I used the same ombré method with a makeup sponge as I did in the first look and the textured bits applied just fine. I used around three coats of Sour Apple nearing toward the edge of the nail. I definitely prefer the look of this mani to the other one, but the texture is irritating. It kept snagging on my clothes and I could hardly run my fingers through my hair. Zoya's PixieDust line is more of a sugary feel, this stuff is like cement. It's hard to remove and very messy with the textured bits going everywhere. I applied Lick-O-Rich, the black shade, on its own on my toe nails and it's been great so far. Then again, I don't use my feet for the same things as my hands so of course it'll be easier. I think the Sugar Coat polishes might be better for shorter nails anyway. Less mess and less to snag on. I'm not a big fan of the sugar coat but I liked the look of fuzzy coat. I used several coats of it and it was such a pain to remove. These are really cool looks though.